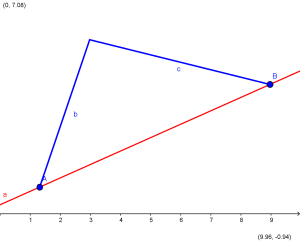 So the geometrical interpretation of Rolle’s theorem is this: if we observe two points of some contionous and differentiable (you can tell that it’s differentiable if it is smooth – no spikes) curve at which the function has the same value, then there must be some point inbetween at which the tangent line is horizontal – the first derivative is zero. Physicaly, the example of interpretation is a ball being tossed up in the air. Based on the theorem (and it’s very logical too), there will be some point in time at which the ball’s speed will be zero. This of course will happen at the ball’s highest point – the extreme value. 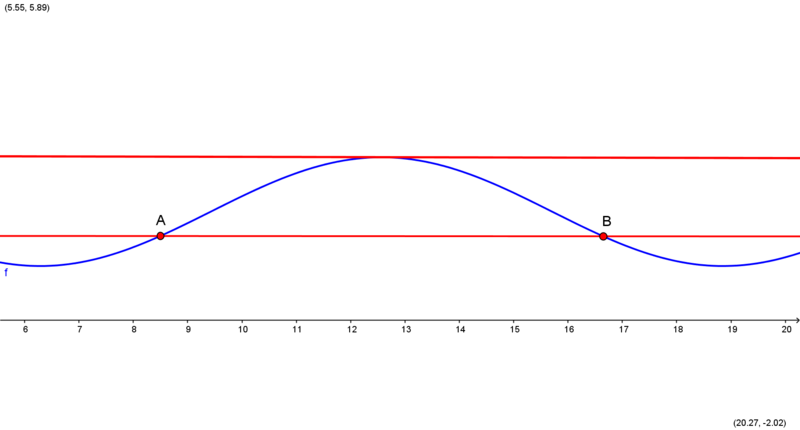 This example’s intepretation is understandable from the graph if you look at x-axis as representation of time, and the curve is behaviour of the ball at different points in time. At point A, the ball is tossed and at point B the ball comes back down on the ground. In between, at some point it reaches maximum height – that’s when its’ speed is zero. 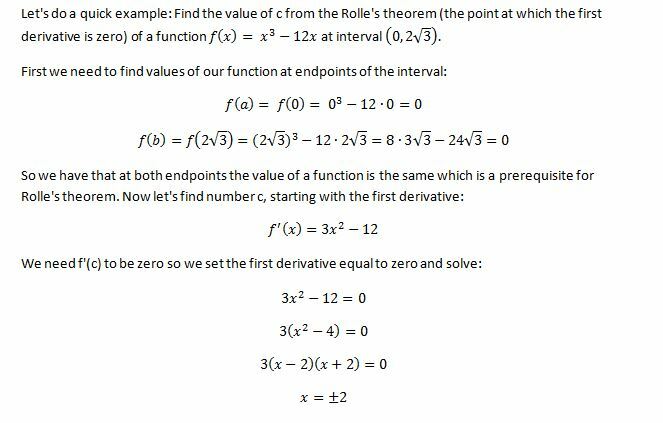 So after some simple factoring we got two solutions. 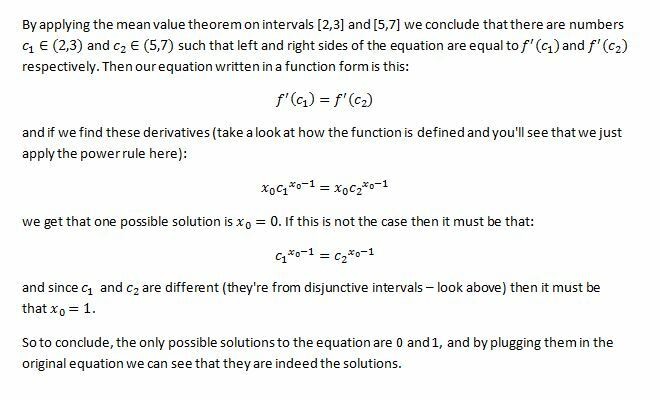 However, we need our point c to be inside given interval, which means that the only solution will be x=2. 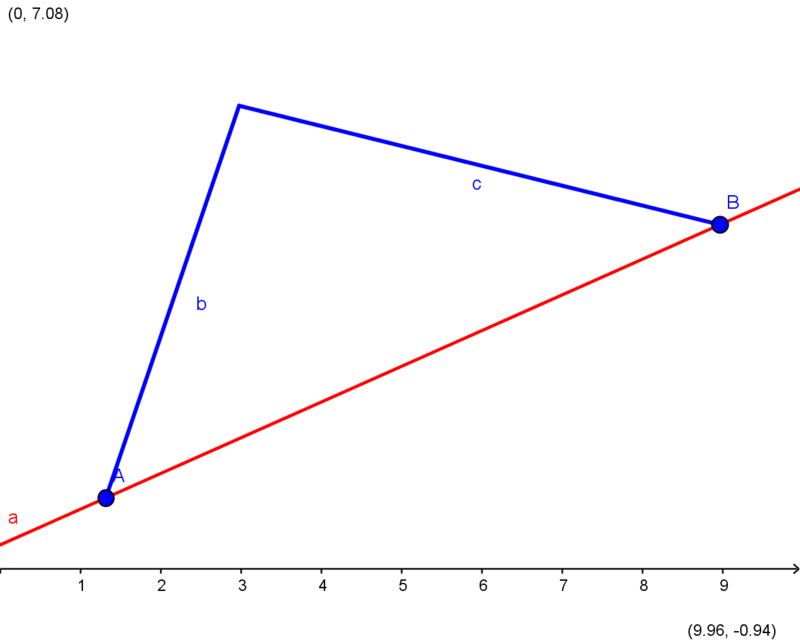 That’s the point at which this functions’ tangent is horizontal. 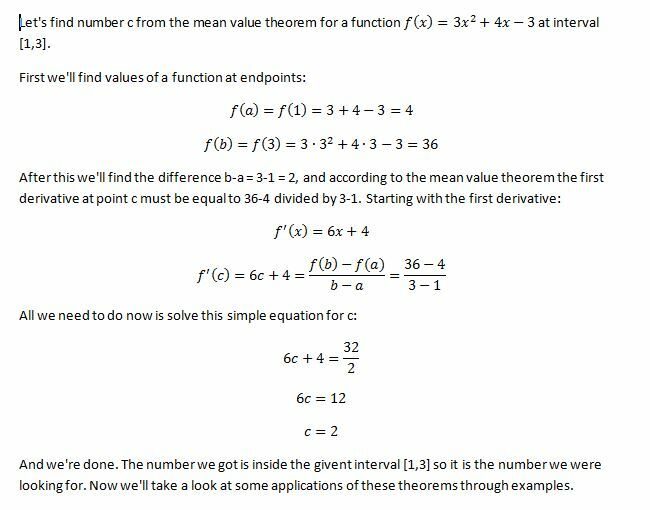 So geometricaly, the mean value theorem says that for a continous and differentiable (smooth) curve we can always find some point c, between two points a and b, such that the slope of a tangent line at that point is the same as the slope of a secant line through the endpoints. Physical interpretation would be something like this. Imagine we were driving from City A to City B which are 145 miles appart, and we got from one city to another in one hour. 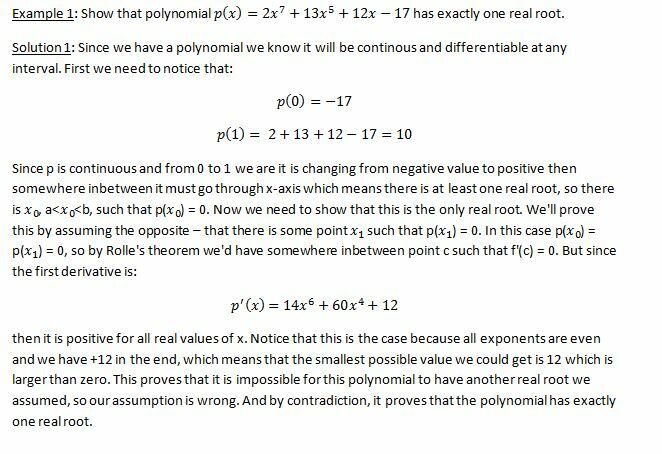 The mean value theorem says that if that is the case, then at some point in time during our journey we were driving at exactly 145 miles per hour (and greatly exceeding speed limit by doing so). 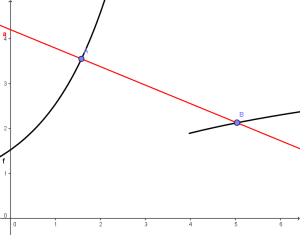 In the graph, the distance between our two cities is the distance between points A and B, and the blue line would represent our speed at different points in time if we were driving at a constant speed of 145 miles per hour. Since we weren’t driving at constant speed, then our speed is represented by the curve, and at point c we were indeed driving at exactly 145 miles per hour. 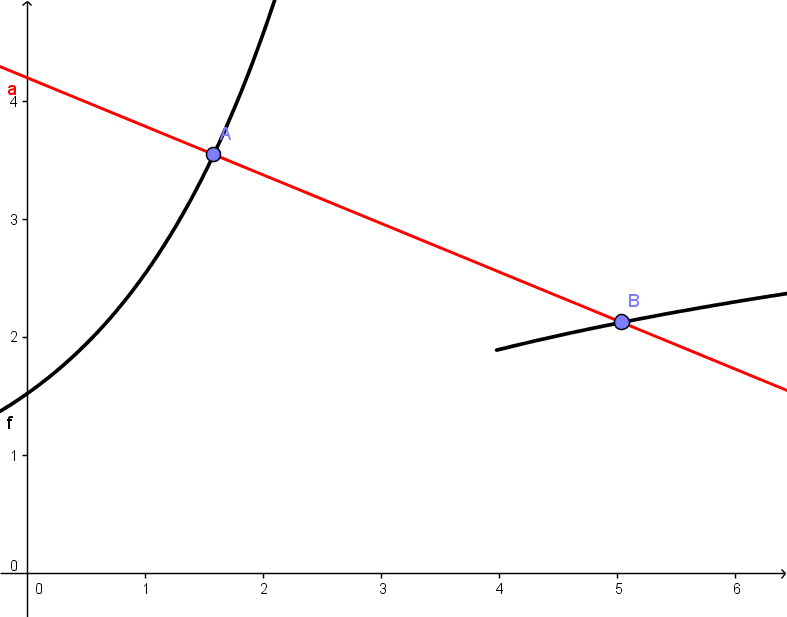 On the left side we have a function that is not contionous at (a,b), and as you can see there is no point inbetween at which the slope of the tangent line would be the same as the slope of the line passing through A and B. On the right side we have a function that is not differentiable on (a,b) (it has a spike, it’s not smooth), and therefore we also can’t find such point c.